Bowflex Selecttech Dumbbells have a big cult following, and we mean BIG. As in the people who use them are sometimes enormous. Little wonder. New gyms are popping up across the UK at a staggering rate, as more and more folk attempt to get into the shape of their life and follow some of their favoured social media stars down the path of healthy weight-loss to the Eden of hard-bodied bliss. But gym memberships can be expensive and some people just don't like all the public grunting. To service that crowd, there are an increasing number of excellent products that allow users to divert their cash towards setting up a home gym. Bowflex Selecttech Dumbbells: what are they? That's where a compact set of adjustable weights comes in. 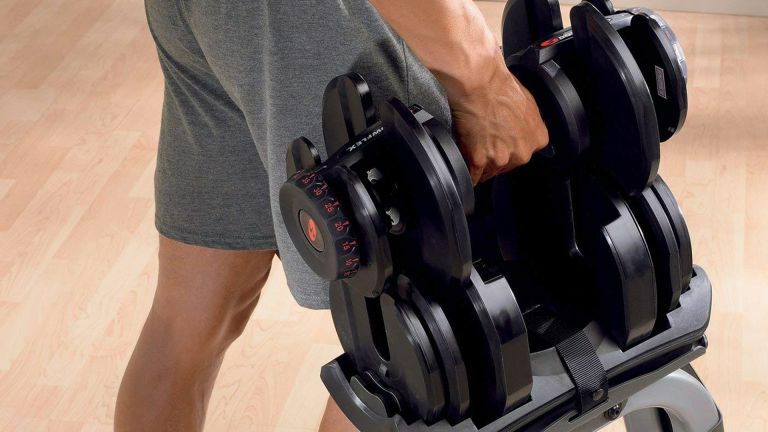 These beefy 'bells from Bowflex offer a phenomenal spread of 4kg to 41kg in a product with a footprint little bigger than a standard large dumbbell. The US brand is among the leaders of this technology and its Selecttech 1090I Dumbbells offer rapid weight change in an extremely compact package that is adjusted by simply spinning a dial located at the end of the weight, which increases or decreases mass in increments of 2.5kg. Bowflex Selecttech Dumbbells: what are they like to use? It might sound like dark magic, but the system is actually pretty simple. That rotating dial turns a little bracket that attaches to a number of skinny plates, which determine the overall weight. This means that it's possible to quickly swap weights during a bout of intensive exercise. Although you will need to ensure that the little plastic tray that keeps any unused weight plates in perfect alignment is nearby when swapping. It is a very good system and the incremental weight plates are perfect for those looking to build muscle mass with the gradual increase of load over time. After all, 41kg should be plenty for those looking to add serious bulk. Bowflex also offers a special stand, which makes storing the weights and replacing the heavily loaded dumbbells a little easier on the spine, but they are perfectly fine to use without. Durable plastic moulding around the plates themselves ensure they don't clank and crash when in use, which will please partners and housemates, while the chunky rubberised grip is much easier on the palms than the knurled beasts you find in fitness centres. Despite build quality being generally excellent, this system doesn't take too kindly to being thrown around or dropped onto hard surfaces, as the bracket and spinning collar mechanism can break. This is worth bearing in mind for more serious lifters as it could be an issue if you want to lift really big during a bench press, for example. In that scenario, that one final, testing rep that helps to ensure progress might normally require you to drop the weights. That would be inadvisable with the Bowflex system. These bad boys are expensive, clearly. Not only will a pair of more traditional dumbbells set you back a mere fraction of their cost, there are even quite similar 'modular' rivals from the likes of Bodymax and Men's Fitness that are cheaper. However, the excellent build quality and the fact that this selectable dumbbell can go all the way to the heady heights of 41kg mean it's worth considering shelling out if you like to get technological about your fitness.